Wow, the weeks flew by and we are one week away from posting the reveal. 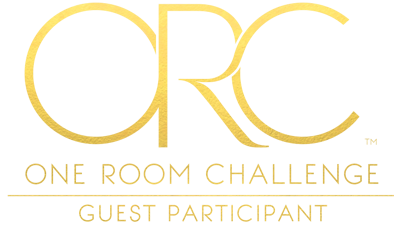 I’m seeing a lot of amazing projects coming to life by the Interior Designers participating in this fun One Room Challenge hosted by Linda from Calling It Home and Better Homes & Gardens. In case you missed the previous post here’s the link to last week’s blog. With one week left it’s all about pulling things together and getting it done. And if you have a chance, check out what everyone else is up to at week 5. Lights, camera, action! The lights have arrived! I chose this unique table lamp because it felt like it was an art piece and a light in one. Just love how fun the light is and can’t wait to see it in the room. What do you guys think about my choice? Is that the one you were hoping I would select? Received a lovely email from West Essex Lighting Studio letting me know that the lights have arrived. Can’t wait to go over to pick them up. Thank you so much for sponsoring the One Room Challenge West Essex Lighting Studio. You guys sure do work well on a deadline and got this light just in time. After decades of being used as a wall hanging and years in storage, the rug finally received the treatment it deserved. Thanks to rug cleaning pros, the rug is now as brand as new and full of color. 5. Accessorize & take pics! Thank you for visiting. Don't forget to connect with me on instagram, facebook and to sign up for my blog. See you all next week for the reveal!